Here's a fun little activity that can be used in whole group, small group or in a literacy center. Students will use the cards provided to sort nouns and pronouns and then complete the activity sheets. If you like this activity I would love feedback! Working on possessive pronouns? 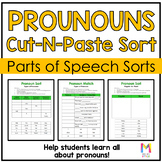 Use this sort, cut, and paste activity to engage your students as they work to replace possessive nouns with possessive pronouns! Answer key included! Use this sort as a way to practice identifying subject/object pronouns. This could be used as a fun activity or informal assessment. 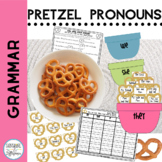 Teach your students pronouns with this thematic activity. Your students will sort he-she-they according to the picture they see. If your students require additional visual support, they can utilize the word + picture response to correctly sort. Teachers: Cut the pronoun cards up and place them in an envelope. 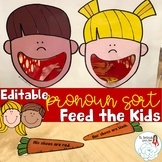 Have your students sort the pronouns in the appropriate category. There are a couple of words that are in two categories – those are included twice. * I also created these to use on your word wall. Thing 1 and Thing 2 can help your students learn the difference between nouns and pronouns with this cute sort.